One, Two, Three. Three votes, that’s all it takes. The new city council takes their seats in the council chamber shortly after the swearing-in ceremony for Mayor Matt Hall and the two new council members of districts one and three (right). This was the first election season the new districting policy has been implemented bringing in the one and three districts. The simplicity of getting three votes was an early lesson in Carlsbad City Mayor Matt Hall’s political career on the five-person council. His predecessor and mentor the late Bud “Buddy” Lewis taught him well. It was about maintaining grace with your fellow council members, even when you disagree. The simple rule is so obviously contrasted with the complexity of building and maintaining relationships. “‘You never want to upset somebody because the next item on the agenda you might need three,’” Mayor Matt Hall reflects on Lewis’s words. In recent years, Carlsbad has only seen two familiar faces in the mayoral office. Other than Lewis, Hall has been at the forefront of all happenings within the city. 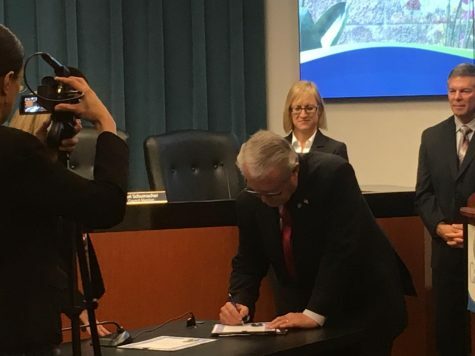 This past November, Hall was reelected for a third term, seemingly following the footsteps of long-term mayor, of 24 years, before him, Mr. Lewis. 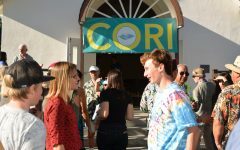 Hall represents not just strong leadership and conservatism in Carlsbad but is an example of how crucial relationships are to accomplishing anything in this city and beyond. Mayor Matt Hall signs the contract after he is sworn in in City Hall on Dec. 11. This is the third time Hall has signed the mayoral contract. Although Hall is known for his economic conservatism, he is also the reason most North County cities are now a banded unit. Hall has played a role in the unification of the mayors in surrounding cities to create an economically flourishing powerhouse of North County. The cities joined forces around 2010 to fight the financial crisis together and keep as many jobs in North County as possible. “[We] kept jobs here regardless if it was in Oceanside because people in Carlsbad work in Oceanside, and people in Oceanside work in Carlsbad. Keep them here, whatever it takes, we got to keep them here and then grow back from that,” Hall said. Aside from his civic duties, Hall is the epitome of a family man. He had coached his daughters in Lightning Soccer Club up until the end of their high school career. One thing he’d like to stress is that his teachings in soccer are that of real life. As a coach, Hall leads a team of 15 girls teaching them to work towards a single goal. Hall emphasized the connection to government and how to assess failures to learn and apply it to real life. Mayor Matt Hall holds his hand up and takes the oath during his swearing-in ceremony for the third time in his life. “You’re not always going to win in life, so when you lose in life or things don’t go your way, how do you go back? What do you change to learn from that to move forward?” Hall explained. Building up a trusted team and getting them to work together is like Hall’s work in the city. The mayor credits many of his accomplishments to those who help him along the way. He explains how the city itself works like a unit to achieve greater things. “I mean, I can’t stand and say, I did this if I said that I would just simply not be telling the truth. It goes back to the relationships, the collaboration and building the teams,” Hall said. 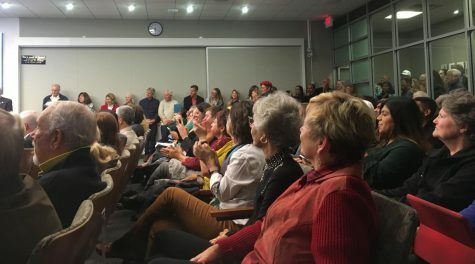 The council chambers are packed with Carlsbad residents wanting to see the Mayor and the new council members sworn in. Although running city hall meetings and accruing accolades has its perks, Hall makes sure to mention the challenges his job entails. His workdays range from eight to 12 hours per day, which takes a toll on life outside the office. “I know who gives up the most is your wife and/or your family when you work like that. And so trying to bring them into making all this work is an extreme challenge. And I can’t stress that enough,” Hall said. Hall mentions how with all the time away from home, he misses precious things like barbequing in the summer, which he tries to do twice a month. After a large family gathering with no leftovers for their house, following this last Thanksgiving, he got to barbeque a turkey for him and his wife. “Since then, the joke is we barbecue more than one Turkey. But it keeps me home for four or five consecutive hours, so I’m basically doing something that she perceives as chores,” Hall explains. His wife, Phyllis, has played a crucial role in not just tolerating his long hours but supporting his campaign. This last campaign season she faced some health issues and couldn’t aide the campaign as much as usual, although their relationship has balanced his job well. 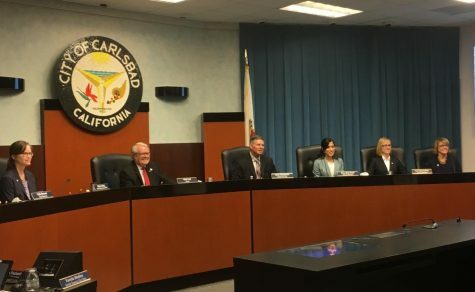 Overall, Hall has mastered relationships on the board, in the community, and with his wife to support his community making Carlsbad the amazing city it is today. His passion for making the city its absolute best has truly inspired positive change.